The Venn diagram and associated table of countries below are intended to help navigate the alphabet soup relating to Europe and groupings of European countries, ie the intergovernmental organisations (or international governmental organisations, IGOs) that are the EU, EEA, EFTA, Council of Europe and signatories to the CoE's Convention 108. A key and usage notes are below the table. 108 = countries where Convention 108 for the Protection of Individuals with regard to Automatic Processing of Personal Data is in force. CoE = Council of Europe (not including countries with observer status such as Vatican City/Holy See - see Notes at the end). In all CoE countries (except for San Marino), Convention 108 is in force. The Venn diagram above should be straightforward to interpret - for example, (top right) the Council of Europe (CoE, in orange) has 47 member countries; the orange rectangle encompasses of those countries, which comprise the 14 countries listed in the table (after the diagram) under "14", the 4 EFTA countries in the red rectangle and (under the red "1" and "3") in the table, the 28 EU countries shown in the table under "28 (EU)" and the 1 country under the orange "1" in the table. Similarly, Europe has 50 countries (bottom left, blue), comprising the 14 countries in the table, 1 + 3 EFTA countries, the 28 EU countries and also 1 country (orange "1") plus the 3 more countries (3 in black towards the bottom left of the diagram) listed in the table under "3" as Belarus, Kazakhstan and Vatican City. Another example: the countries listed in the table under "14" are members of Europe, Convention 108 and CoE, but not the EFTA, EEA or EU. The 3 blue countries are part of Convention 108, but not the CoE or Europe. Conversely, you can search the table for a country's name, find the heading which it's under (eg 28, or 14, or red 1), find that heading (eg 14) in the diagram, and check whether that country is a part of Europe/EEA etc, by seeing which of the coloured rectangles that heading sits within. For example, Switzerland is under the red 1 heading in the table. 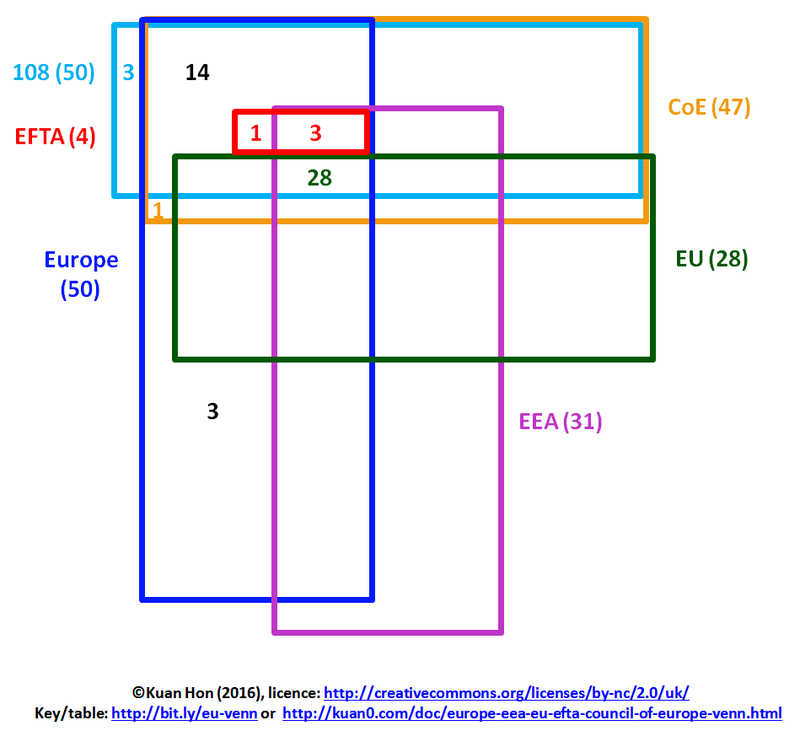 Looking at the diagram, the red 1 is within the red rectangle (EFTA), also orange (CoE), turquoise (108) and blue (Europe), but not in the pink (EEA) or green (EU) rectangles. So this means Switzerland is a member of EFTA, CoE, 108 and Europe, but is not a member of the EEA or EU. This information is up to date as at 23 October 2016, so does not take account of countries joining or leaving any of these groupings after that date. While the diagram produced with the online tool seems to have been proportional, my diagram, which includes 6 sets of countries (the tool only goes up to 4), was designed for clarity and ease of use rather than proportionality, and because of my manual additions and changes may not be fully proportional. For some other common acronyms for international organisations or groupings of countries whose members are not mainly in Europe, see - APEC, BRIC, G20, and UN. For a Venn diagram relating to UK, Great Britain, British Isles etc, see Wikipedia. I generated the first cut of the Venn diagram with this free online tool, then edited the resulting diagram and table manually to add EFTA, remove zero counts, thicken lines, match up colours to text, etc. The result is not exactly to scale. Content copyright © Kuan Hon 2012-2018. Design by NodeThirtyThree Design.